As a small business, your marketing will only be as successful as your branding elements. These visual representations of your business (found on your logo, website, social media, business cards, and so on) communicate vital information about your business and also boost customer recognition of your company. Since branding your biz is such an important area of small business success, I recently interviewed an expert on the topic – Pam Webber, the Chief Marketing Officer at 99designs. 99designs is a graphic design marketplace that helps meet all graphic design needs of small businesses and entrepreneurs. They are well known for their logos and brand packages, but they provide just about any graphic design service you might need – logo, website, social media assets, business cards, stationary, email templates, landing pages, website materials, packaging, trade show materials, and pretty much ANYTHING you’d ever need for branding your biz online and off. As a personal customer of 99designs, I can attest that this is an amazing service for small business owners who want to have professional and polished branding elements. As Pam mentions in the interview, there are 10,000 designers online at any one time, and 99designs walks you through the process of getting the branding materials you need. First, set up your project, including answering questions about your project and business so designers understand your needs and can capture it in a design. Then, they use a contest model where designers compete to work on your project. You’ll get many designers submitting ideas, which means lots of choices plus reasonable costs that work with a small budget. In the interview, Pam shared plenty of advice and tips for small business owners regarding branding your biz. I’m going to highlight some of her main tips below, but since she shares so much valuable advice, I urge you to listen to the interview in full. 99designs recently released a report to help small businesses choose the right colors for their branding elements. The Business of Color: Logo Design combines internal data (hundreds of thousands of logos they’ve created over the years) with research on the psychology of color in order to walk you through the process of choosing the perfect colors for your business. Brand Personality – What is the personality of your business? What is your value proposition? What do you want to communicate about your business to consumers? Your Customers – Who are your target customers? What are they looking for when purchasing the product or service you offer? Color Associations – Every color has certain natural associations. Which of these natural associations fit with your brand? Your Competition – Knowing what colors your competitors are using can also help you choose a color For example if you’re a landscaping company, green is an obvious choice – but if all the other landscaping companies are using green, you may want to find other colors so you can stand out. 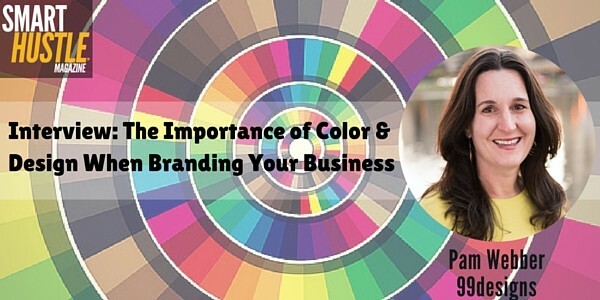 CMO of @99designs explains why color choices are so important for your #biz #brand. Design doesn’t come naturally to all people. Some people are just naturally talented, others are good because they have lots of experience, then there are the rest of us who need a little help to create a polished image that works for our brand. When it comes to design, should you do it yourself or hire a designer? To make the right decision, you must be conscious of what your efforts (money and time) are going into. Is it better to train yourself to become better at design then take the DIY route, or is it better to outsource to the experts so you can focus on other aspects of the business? That decision is up to you – but whatever way you go, well-designed branding elements are a MUST. In the interview, we dive deeper into the topics listed above, and we also talk about other aspects of branding your biz. If you’re just getting started, you’ll want to hear Pam’s three design tips for small businesses. If you’re already established, you need to hear Pam’s advice on three ways to know if it’s time to rebrand. Branding your biz is one of the most important elements of marketing success, so take advantage of Pam’s knowledge by listening to the full interview now.